C-Arm Rentals Call 702.384.0085 Today! Need a C-Arm? Why buy when you can rent? 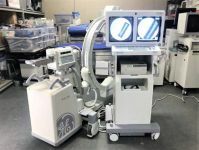 KenQuest provides low cost month to month c-arm rentals with little out of pocket. Call us for more information. Ranked one of the best brokers in the industry. 100% Quality Guarantee when you do business with A. Imaging Solutions. Call Today 205-823-7907. Comments: Ziehm Vision RFD 3D needed. Please quote available systems with pricing.